For Stuart Hall, inferential racism describes “representations of events and situations relating to race” which appear to be natural, “whether ‘factual’ or ‘fictional'” and “which have racist premises and propositions inscribed in them as a set of unquestioned assumptions” (162). He juxtaposes this term with overt racism–the advancement and proliferation of overly racist attitudes–which incidentally was my only conception of what racism was for the majority of my life. My inability to see inferential racism was a clear manifestation of how inferential racism worked; because racist premises were brought up in a way that made them natural and unquestionable, I saw them as reality. This all brings me to Spike Lee’s Bamboozled because what I found most stunning about the film was how inferential racism was made overtly racist. By this I mean, that racist ideas that are often taken as “unquestioned assumptions” are in Bamboozled vocalized and illustrated in such a way that those same “unquestioned assumptions” when actually vocalized or enacted become obviously racist. When for example, a white male tells De La Croix that the reason that there are no black writers in their writing team is because there simply must not have been any qualified black writers, the unspoken and believed-in truth becomes laughable and ripe for criticism. This constantly occurs throughout the course of the film. Whether it is De La Croix’ boss who proclaims that he understands more about the African American experience than De La Croix because he is married to a black woman and is a fan of black entertainment or it is De La Croix’ own remark during the auditions for the Man Tan Show that there are so few roles for black entertainers that they would perform for even the most dehumanizing roles, the viewer must contend with the fact that what has been inferred as naturally true is truthfully racist. I naively believed that taking away the power of invisibility would give catharsis to inferential racism, but in the world within Bamboozled, the racism simply becomes more pronounced with the Man Tan Show’s rise in popularity; no longer are white audience members looking to black audience members for approval to laugh now white audience members are wearing blackface and calling themselves “niggers.” As a white viewer, myself, the unveiling of inferential racism becomes unsettling once the persistence of this unveiling continues. I became overwhelmed by the constancy of the unveiling and the elaborateness of structural racism in our society. Bamboozled offers no catharsis; the unveiling does not lead to the disintegration of structural racism in American society in fact it strengthens structural racism. Ultimately, I believe that Hall would appreciate Bamboozled‘s ability to get the film’s audience to recognize inferential racism even though the audience of the world within Bamboozled appears to be unwilling to notice or care that inferential racism is being unveiled. 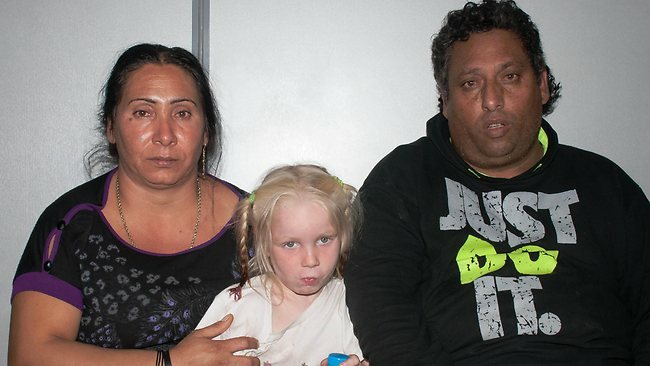 The international news story above of the finding of a blonde girl in a Roma family is yet another manifestation of structural racism; the police took the girl away from her family on nothing more than the visible racial difference between the girl and her family. EXCELLENT example, Maria — especially since the defense for this is that “it’s natural” to believe that a child who looks like this wouldn’t be with people who looks like that. Though the parents did admit that it is not their child, proven by DNA tests, and that the mother simply “gave” her to them. The overall reaction of to the “angel child” as they’ve been calling her is pretty damn racist, but there was cause to remove the child from their care. Jack, I understand that the parents in question were neglectful. However, the parents’ neglect was only noticed when the police were profiling a marginalized group–the Roma–and noticed that this particular family had someone who didn’t look like them. It was on these grounds that the child was taken. The couple’s children that look like them and were similarly neglected were not taken away. Another way to think about it is this: if you saw a white couple with an Asian child at a restaurant, would you automatically assume that the child was kidnapped or would you assume that the child was adopted? Just because there was “cause” to remove the blonde angel in the case of the first blonde angel, it does not mean that inferential racism was not at work.